This brilliant comedian first rose to mainstream fame in the year 2000 with his Live at the Top of the Tower tour. He has gone on to be a great success with more stand-ups gigs, TV programs including the brilliant ‘Phoenix Nights’, ‘Max & Paddy’s Road to Nowhere’ and ‘That Peter Kay Thing’. And don’t forget to couple of charity songs he has released including Amarillo. 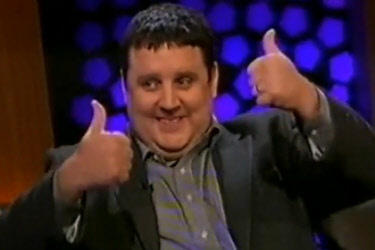 Here is a collection of funnies from this top British comedian, Mr Peter Kay. Below that you can also take a peep at a video of him in action. Peter perhaps became most famous for his line “Garlic bread! Garlic on bread!”, which many say was over used by himself and others doing impressions. It was very funny at first but you can have too much of a good thing. Another quote was “cheesecake, a cake of cheese!”, equally good but thankfully it wasn’t as overused as much. Another was the one referenced above; “Booked it, packed it, fucked off”, now that is still a winner! Despite being one of the most popular stand-ups in the country Peter doesn’t do comedy panel shows like other comedians. So watch out for repeats of his shows, or catch him on guest interviews. If you want to enjoy even more of his work you will find lots of his DVDs available to buy. Copyright: Image used is a screenshot taken by ourselves from a video.